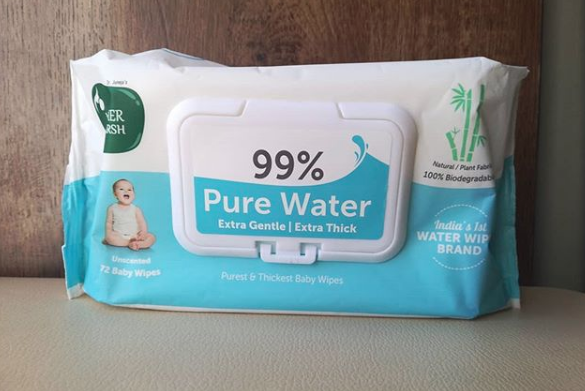 India’s Premium water wipes brand, Mother Sparsh, has launched a new version of their water based baby wipes which has been proven an instant success due to its new features. The brand excels in the area of wipes production and the new wipe is the most suitable for baby skin as it is unscented and made of medical grade cloth that protects the sensitive skin of the baby. Since the wipes are specialty baby products, the composition of it is of prime importance to the buyer, parents. Devoid of harmful addictive ingredients like Alcohol and Parabens, the wet wipe prevents drying out the baby’s skin and does not cause any skin issues. The main highlight of the product is its water based composition. As the wipes are made of 99% pure water, they do not leave a soapy feeling on the skin. Other brands of baby wipes are usually heavily scented which is harmful for the sensitive baby skin, hence, the unscented baby wipes of Mother Sparsh has more and more customers inclining to this choice. Skin that is prone to diaper rashes and skin allergies requires fragrance-free products that directly come in contact with the skin and Mother Sparsh has designed their new product to meet exactly that requirement. Another important component is the material that has gone into making the wet wipes. But this new product is crafted from plant based fabric which is befitting for cleaning baby’s bottom, hands and mouth. The extra gentle wipes are super soft on the skin to touch and its medical grade fabric offers an efficacy like never before that prevents bacterial and yeast growth on the skin. The baby wipes that are usually this efficient, are smaller in size or are thinner than expected, But these premium baby wipes are three times thicker than the standard wipes and one wipe easily does the needful. The almost towel sized, super thick wiper help you not to get your hands dirty in the process. The new launched product can be rounded off as complete safe for use on baby skin, the fabric is porous and permeable and velvety soft on the skin, extremely smooth, breathable and also highly absorbent. The product is made using zero percent polyester; hence, it is non-irritable on the skin. The water portion is balanced so that it is neither overly soaked in water nor it leaves the skin dry. This product is tested in dermatological labs and is scientifically proven to prevent rashes. Commonly, the disposable wipes come contained in plastic pouches with a sticker opening on the top. The sticker loses its ability to stay stuck over time and gradually the moisture fades from the rest of the wipes. The solution comes in the new packaging of the Mother Sparsh product which provides a moisture lock plastic lid that completely seals the wipes off and prevents the moisture from evaporating. The new launched product is already highly recommended by the customers as its integrated features are hardly resistible. One standard pack usually contains 72 wipes and the biodegradability is the added bonus of the product.